This summer I've been having a great and relaxing time stepping away from the classroom for a bit. I've been reading and reading and reading, writing, and volunteering to lead stream studies at a local summer camp. It's also helped me to realize the importance of stream surveys for science education. Getting kids into a stream and looking for living things immerses them in scientific thinking. So...here's the accumulated wisdom that I've managed to gather over the summer! Not every spot in a stream is suitable for a stream study, especially for younger students. The best spots have a nice, rocky beach, plenty of shade, and a variety of stream habitats. As the adult in charge, remember that you are responsible for the safety of the children, so make sure that you have walked the entire section of stream to check for hazards such as deep pools and poison ivy. Also, be aware that some kids will absolutely not want to walk in the stream. This is fine! Choose a site that provides a walkable bank to allow for this. Remember, for some kids a stream is a mysterious, almost frightening place--you want them to be able to explore at their own pace. Before anyone gets in the stream, brainstorm safety rules and boundaries. Remind students that the rocks are often slippery, and act out best practice walking techniques, especially with "seesaw rocks". You can learn a great deal about a group by asking the question, "What do you think we'll see?" Because I'm in rural Pennsylvania, many kids bring knowledge of minnows and crayfish to our stream studies! In other places, you may find different levels of stream knowledge. This is also the time to briefly outline the collection tools and proper handling of stream creatures. "We don't want to harm anything!" I tell kids, and they earnestly agree. The ice cube trays are perfect isolation containers for individual creatures, while the larger basins hold fish and crayfish. Be sure to keep everything in a shady spot so that temperatures don't soar! This is what I hit upon over the summer that made stream studies so much more successful. Instead of talking about the biotic index and macroinvertebrates first, I got kids into the stream as quickly as possible. Inevitably, they gravitate toward catching crayfish, salamanders, and minnows. This is fine! These are the obvious creatures in the stream and they want to capture them. I walk up and down the collection area, making sure that things are going well and offering advice. After about 15 minutes, get the group back together to discuss what they have found so far. Write down the species of animals that students have found and do a quick biotic index. Here's how it played out with my most recent trip: "We've found 3 species of animals so far, and we have a score of 2 on the biotic index. But an earlier group found 11 species and had a score of 18. What do you think is different today?" In every case, kids saw quickly that they weren't looking carefully enough! This is when I introduce the term macroinvertebrates and show kids the stream study guides. Now that they have found the salamanders and minnows and crayfish, they are much more receptive to looking for the smaller mayfly nymphs, water pennies, and dragonfly larvae. (Why is this? I have no idea!) Depending on the age of the group, we even act out turning over rocks, looking for creatures, and gently returning them to their original locations. This is also when I briefly outline the biotic index and how to use it: "Scientists have a tool called the biotic index to help us make a good guess about a stream's health. By looking at the macroinvertebrates in the stream, we can see if the water is high quality or not." Kids head back to the stream for a second round of collections, and this time they use different methods. On this phase, we find the dobsonfly larvae, the mayfly nymphs, and the caddisfly larvae. As they put creatures into temporary observation containers kids also inquire about their biotic index score and the number of species they've found. Some playful competition between groups and weeks helps kids to see what kinds of scores others found in the same stretch of water. Of course, all of the kids want to see the creatures that were found and hear their names. I have kids stand in a circle while a counselor or another camper walks around with the specimens. Then, each item is carefully returned to its home. I always emphasize the safe return of creatures as the most important part of the process. Our goal is to help the stream to stay healthy and harm no living things. Finally, we discuss the overall health of the stream. Does this stream have high water quality, or not? How can they tell? What can they do to keep it healthy? And that's it! The final step--send kids back with their counselors and return to my car, where I have a cold VitaminWater waiting for me in a cooler. Ah, the joy of a cold drink after a long afternoon! 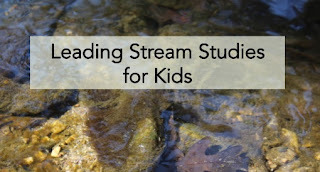 Do you have tips for conducting stream studies with kids? Add a comment! If you're working with macroinvertebrates in a formal lesson, you may enjoy the reading selection in Summary and Analysis: Macroinvertebrates or the Biotic Index text in Problem and Solution Texts.